Want to know how to create a Christmas marketing campaign that stands out? While Christmas may be one of the most wonderful times of the year, it can also be one of the most stressful. Especially if you are a business owner. One of the biggest challenges business owners face at Christmas time is making sure their Christmas marketing campaign stands out from the competition. In the run up to Christmas, consumers are bombarded with numerous messages and advertisements from businesses of all sizes. So it is imperative your business stands out if your Christmas marketing campaign is going to be successful. Firstly, here are a few retail dates for your calendar. Consider how you could build these into your Christmas marketing campaign. Black Friday: this is the fastest growing retail search day. It is thought of as the beginning of the shopping season. 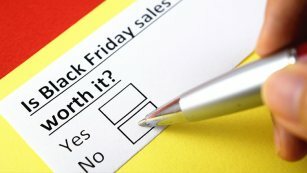 Black Friday promotions can vary from one day events to week long events. Green Monday: Similar to Cyber Monday. Green Monday was first used by eBay to describe its best sales day in December. This is usually the busiest online shopping day before Christmas. Your Christmas marketing campaign is the perfect opportunity to refresh your marketing materials. It is the perfect time to ensure everything is up to date and targeted to your audience needs during the festive period. Your Christmas marketing campaign may include seasonal branding, adding a Christmas logo to your website and branded literature is a fun way to build excitement in festivities. It gets customers thinking about Christmas and it shows that your website and collateral are up-to-date. There are many ways you can include creative into your campaign, whether it is a gift guide to make customers aware of your products or a special offer leaflet or email. When you have designed your marketing materials think about which marketing channels you will use and how. For example, will you email your customers your latest special offer or will it go out in the form of a direct mail campaign? How can social media be used to help spread the word and drive interest in your business? Christmas is all about giving and your Christmas marketing campaign should be too. It is important to make your customers feel extra special, whether you offer bespoke offers or include a small gift with every purchase – it can be a great way to give a little something back and drive customer loyalty. Think about including a charity donation as part of your Christmas marketing campaign, after all it is the season of giving. Donating to your chosen charity helps customers identify with your brand and demonstrates you are a caring business. Got any questions about your Christmas marketing? Speak to Blackberry Design to see what we could do for your business. Get in touch on 01527 517309 or fill in our contact form.